You are here: Home / Blogs / Peace & Violence / Who Calls Anyone Civilized? Editor’s Note: This article was written by “Voices for Creative Nonviolence” co-coordinator Cathy Breen and submitted by Raven contributing author Kathy Kelly. It was originally published at Voices For Creative Nonviolence. Editor’s Note: Kathy Kelly co-coordinates Voices for Creative Nonviolence. She and her colleagues are peacemakers who travel to some of the world’s deadliest or most impoverished places. Kathy herself has been to prison numerous times for nonviolently resisting the United States Empire. While mimetic theory may not be mentioned explicitly in the articles that Kathy Kelly submits on behalf of herself and her friends, the articles she shares with the Raven Foundation give voice to the victims of the policies of the United States and her allies. Amplifying the voices of victims, exposing our entanglement with sacrificial systems of violence, and working for nonviolent resolution to conflict and reconciliation among all parties are among our primary goals at Raven, and we are honored to have Kathy and her colleagues share their stories of peacemaking and nonviolent advocacy for justice on our site. Cathy Breen ([email protected]) co-coordinates Voices for Creative Nonviolence (www.vcnv.org). She lived in Iraq throughout the 2003 “Shock and Awe” bombing. For the past 15 years she has regularly visited with and advocated for Iraqis who’ve been displaced within Iraq or seek refuge beyond Iraq. Images: Photo Credit: Abu Muhammad. 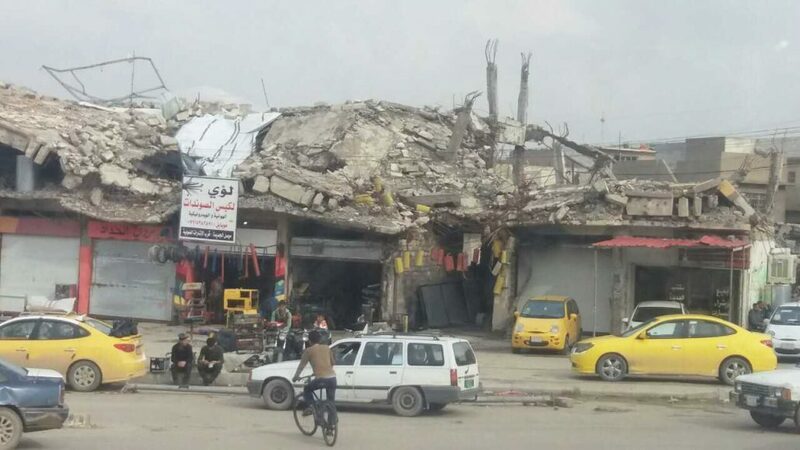 Featured image caption: “”Shop remains open in area of Mosul decimated by bombing, March 2018.” Submitted with article.